The retiree will love this special retirement gift from family, friends, coworkers or employer - company. This photo of an enchanting monarch butterfly relaxing on a butterfly bush includes the poem: Happy Retirement! If nothing ever changed, there'd be no butterflies! May retirement bring all the freedom in life to embark on new adventures and fulfill your dreams. May you now spread your wings and fly. Give a gift that shows "You are appreciated" - "You are special." This gift celebrates not only a special occasion but more important appreciation of the unique individual. This special retirement keepsake includes an 8x10 double mat as viewed. Printed with high quality photo paper and ink. 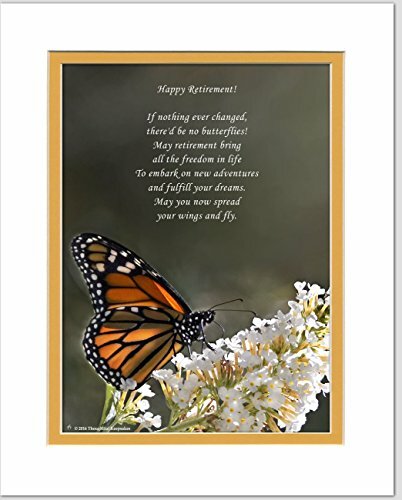 For other non-personalized matted photo or poem choices or to view a selection of my personalized gifts, with or without a frame, just scroll to the top and click on Retirement Gifts Personalized. If you have any questions about this product by Retirement Gifts, contact us by completing and submitting the form below. If you are looking for a specif part number, please include it with your message.